LeBra 55508-01 - LeBra All Weather Car Bra - FREE SHIPPING! Looks great on and protects to front from getting scratched. This is a replacement for my previous and very old and weatherbeaten LeBra. Actually seems to be a little better constructed than my old one, and the price was really good. Also I didn't have to use very many cuss words to install it. Haven't used a bra for my Mustang in years, but I wanted to cover up some scuffs and dings on the bumper. Much better clips than before. Had some issues with my order, and it was rectified within a few days. Good product, excellent service! I have not used it. I will be returning it. After reading the installation documents, it clearly states that the product should NOT be installed on a car without Factory Paint.. 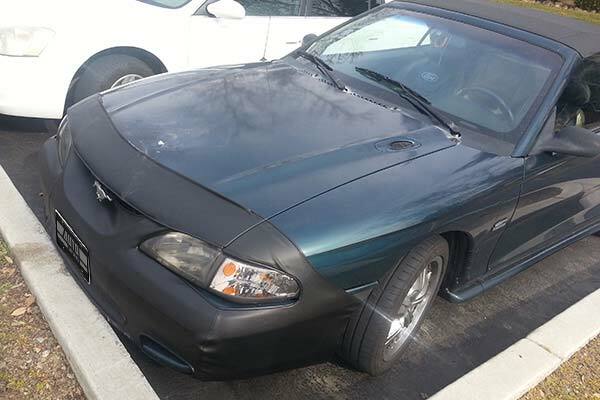 I had my Mustang Repainted and now am concerned it would warm my vehicle. No where in the description online did state this issue about the product and it should have. Looks great, hides stone chips, prevents new chips. My car was a "color change" repaint. The nose would get stone chips which sometimes exposed the old color. This was the perfect solution. I haven't used touch up paint since! I was very impressed as to the looks and quality of the Bra.No disappointment here.It was very easy and quick to install and no tools needed.It fit like a glove and very professional appearance.The price was a great bargain for a very nice product.AutoAnything treated me with respect and a very professional manner.Shipping was free and the product was delivered ahead of the forcasted time for shipment.I am very pleased with the product and the customer service.Have bragged to many of my friends. was the worst bra I have ever bought just don't fit right look very crappy!!!!!!!!!! replaced the original bra with one exactly like the old. old bra lasted 12 years. hood dented slightly and repair job cost 5 times what the bra cost. this was my 2nd purchase of the LeBra for my Ford Mustang and i can tell you that i have been extremely satisfied with the LeBra. I bought LeBra in 2001 and it has held up very good in all weather situations. I wanted a newer looking LeBra which is the only reason i bought a second one. They make the car look more sportier and they protect the frond end from harsh elements rocks, sand, insects on the road...an overall awesome protector with an AWESOME look! The picture post is the older LeBra...it still looks good, eh? I bought the car bra mainly to cover up some front end damage on my mustang, and overall I think it was a great buy. It looks great, was pretty easy to install, and was of good quality. My only complaints are 1.) that I think it was a little too pricey, but still the cheapest I could find, and 2.) it ripped slightly around a hook when I installed it the first time. Aside from that, nothing else. It looks awesome! This fits perfect, covers scratches on the bumper. Exactly what I wanted. The leBra product I replaced was at least 15 yers old. the new one fit like a glove and every detailws perfect. Fit and finish ws accurate and high qulity. I would strongly recomend LeBra to anyone who wants to protect their vehicles appearnce. This is an excellent product and I'm planning to buy from AutoAnything in the future. I purchased this one to replace one that lasted almost 5 years. This was a pleasant transaction. Thanks. Makes my car look Great! I had it installed in 10 minutes. It fits like a glove and can be removed easily when waxing my car. Reference # 759-608-538 © 2000-2019 AutoAnything, Inc.